Chicken is my husbands favourite ingredient and he loves curry so its obvious that I make this Kadhai chicken for him often. 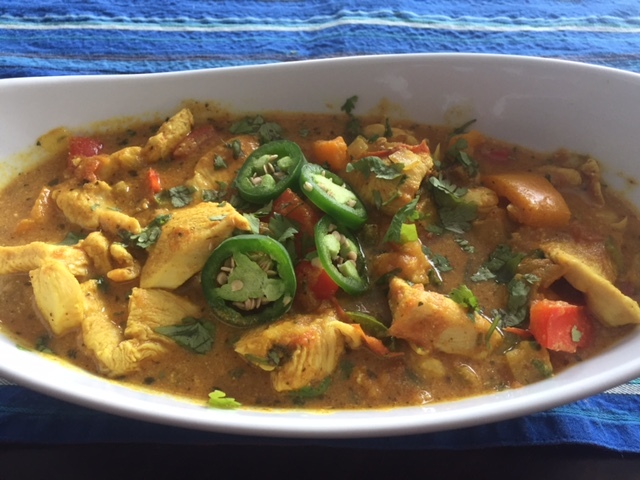 Kadhai Chicken is a flavourful curry with a blend of various spices. You can enjoy this dish with naan, roti, rice or parantha. Kadhai dishes usually also include bell peppers. Although Kadhai referes to a kind of dish ( sort of Wok) in which the dish is made, you can prepare it in any pan/skillet that you have in your kitchen. Here is a recipe for Kadhai Masala Spice Mix. In a wok, add oil. Let oil become hot and Fry bay leaf and cinnamon stick for 30 secs. Add chillies and tomatoes. Mix well. Cook until tomatoes reduce in volume and no longer raw. This will take 4-5 mins on med heat. Add chicken. Let it cook for another 2-3 mins and then bell peppers. We dont want peppers to wilt completely. They should maintain some of their crunch. Add some water. Cover and cook until chicken is no longer raw. Add kadhai masala, Yogurt and fenugreek leaves. Garnish with cilantro leaves. Mix well and serve. Kadhai Mushroom is a flavourful curry with a blend of various spices. You can enjoy this dish with naan, roti, rice or parantha. Kadhai dishes usually also include bell peppers. Although Kadhai referes to a kind of dish ( sort of Wok) in which the dish is made, you can prepare it in any pan/skillet that you have in your kitchen. Add ginger-garlic paste and onions. Mix well. Give a minute or two and add salt, turmeric and red chilli powder. Mix well. Cook until onions are no longer raw and change color. Add tomatoes puree. Mix well. Cover and cook until tomatoes reduce in volume and no longer raw. This will take 4-5 mins on med heat. Add mushrooms. Let them cook for another 2 mins and then bell peppers. We dont want peppers to wilt completely. They should maintain some of their crunch. Kadai Masala is a flavourful Indian spice blend that can make ordinary curry dishes extraordinary. Basically we roast whole spices and then grind them to make this masala powder. You can also grind bay leaf and cinnamon stick or use them as such in your dish. Bitter Gourd is not a very popular vegetable since its bitter in taste. However, its good for our system as it’s a blood purifier and also helps control blood sugar levels. Highly recommended food for Diabetic people or when you are recovering from illness. Hi guys, in this recipe video I share with you simple Saag Chicken Recipe. It’s easy to prepare, is quite healthy and tasty. – You can also incorporate other green leafy veggies in your dish like Rapini, Chard etc. I used some frozen Kale leaves as well. 1. Begin by cleaning, eashing and chopping spinach leaves and chop chicken into bite size pieces. 2. Heat a pan and add oil. Once it’s hot, add cumin and mustard seeds and let them sizzle for 30 secs. Then add onions, ginger and garlic. 3. Add salt and turmeric and mix well. Let onions get soft. Once they are no longer raw, add chicken and cook for 2-3 mins until sealed or turns white. 4. Add tomatoes and red chilli powder. Cook further for 4-5 mins. Add spinach, mix well and once done another 4-5 mins, add chickpea flour (mixed in water) and let the dish thicken up. Chickpea flour soaks up the extra water left by spinach leaves. 5. Once cooked, sprinkle garam masala on top and serve with your fav. flatbread. Chicken Afghani is a royal dish, easy to prepare, full of flavour and perfect for special occasions. Make a marinade with cream, cashew paste, ginger garlic paste, lemon juice, salt, pepper and cardamom powder. Rub onto chicken and leave for an hour. When ready to cook.. heat oil and add chicken pieces. Seal the chicken and cook ( or bake at 400 F for 45 mins) for 12- 15 mins until chicken is done. Serve over rice or with naan. Chicken Handi is a kind of Chicken curry, flavourful, comforting and best enjoyed with rice or naan. Heres an easy recipe for Handi chicken that you can make in the comfort of your own kitchen, Recipe serves two. – Heat oil and fry cinnamon, bay leaf, cumin, cardamom and cloves. – After letting them sizzle for a min, add onions and ginger garlic paste. Brown the onions. – Mix well and cook until tomatoes are no longer raw and reduced to 1/4 th of the original mixture. – Add cashew paste and yogurt. Mix well and cook for another 1- mins. Watch and learn how Shahi Paneer (Indian Cottage Cheese Gravy) is made at dhabas – Roadside Cafes. Its fascinating to watch food getting cooked in commercial kitchens. We were visiting India a few months ago from here in Calgary, Canada and had an opportunity to travel throughout our native land and observe various Dhabhawalas create magical mouth licking dishes so we captured few of those moments with our camera to share with our audience. Chana- Chickpeas are really healthy, full of fiber, protein rich and taste so good in a masala curry. Chana Masala curry is easy to make and is a great dish to sere to your guests when they come over for dinner. Here’s how you can convert simple chickpeas into exotic curry. 1. Soak chickpeas in water overnight or atleast an hour. 2. Discard the water and get your cooker ready. 6. Add green chill and onions. Mix in salt, turmeric and red chilli powder. 7. Mix in tomato puree ( by blending 2 tomatoes with 2 tbsp of water). Cook for 3-4 mins. 8.Add chick peas, amchur/ mango powder, tomato paste. Mix well. 11. Once the cooker has cooled down, open the lid and garnish with cilantro leaves. Serve with Coconut Rice. Egg curry is an easy Indian dish and fulfilling too. This Punjabi version of the recipe is my favourite as its flavourful and so tasty. Indian spices give eggs a unique taste and its best enjoyed with a buttery parantha, rice or naan. – Heat oil in a pan and fry boiled eggs until golden brown. – In another pan, heat oil and fry coriander, cumin , cardamom, cinnamon and bay leaves for 30 secs.Add ginger and garlic. — Add onions and mix well. – Add salt, turmeric and chilli powder. Cook for 2-3 mins. – Add tomatoes. Mix well. Cover and cook for 3-4 mins. – Add water and bring sauce to boil. – Add garam masala. Add eggs. – Add dried fenugreek leaves and cilantro. Mix well. – Serve with Roti or rice.